I studied my undergraduate degree in Biomedical Science at King’s College London, during which I undertook an extramural year placement. I worked at the National Institute for Medical Research, where I gained invaluable laboratory experience and developed a special interest in cell biology. I pursued my passion for research through studying my PhD in retinal stem cell biology at the UCL Institute of Ophthalmology, supervised by Prof. Astrid Limb. For the past three years my work has been focused on investigations to promote retinal repair by preventing gliosis mediated by Müller glial cells. Müller glia are the main glial cells of the retina. The Müller cell body is located in the inner nuclear layer but its processes and lateral branches extend through all the retinal layers, contacting all the neuronal cells of this tissue. Müller glial cells have many important roles, including the provision of homeostatic and metabolic support to retinal neurons (Reichenbach and Bringmann, 2013). After damage in the zebrafish retina, there is complete regeneration of neurons with Müller glia being the source of progenitor cells, spontaneously repairing the retina (Fausett and Goldman, 2006). This regeneration occurs throughout life in the zebrafish. In the adult human retina after disease or injury, biochemical and physiological changes lead to the Müller glia becoming reactive. Müller glia become hypertrophic, proliferate and overexpress intermediate filament proteins such as glial fibrillary acidic protein (GFAP), a characteristic of reactive gliosis (Reichenbach and Bringmann, 2010) (Figure 1). Initially this gliosis acts to limit damage, restrict inflammation and provide neuroprotection. Yet, chronic gliosis is detrimental, causing direct or indirect harm to retinal neurons and inhibiting repair. Reactive gliosis is prominent in degenerative diseases such glaucoma, AMD and diabetic retinopathy (Wu et al., 2003, Rungger-Brandle et al., 2000, Graf et al., 1993). Figure 1: Immunocytochemical staining for GFAP (green) of normal human retina from a healthy eye and diseased gliotic retina from a patient with proliferative vitreoretinopathy. After injury GFAP is upregulated, and the inner and outer nuclear cell layers (INL and ONL) become thinner. GCL: ganglion cell layer. 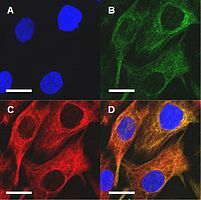 Figure 2: The Müller glial stem cell line MIO-M1 expresses the progenitor marker nestin (B) and the glia cell marker vimentin (C): merged image (D). Nuclei stained with DAPI (A). Scale bar represents 20µm. In the human retina, a subset of Müller glial cells have stem cell characteristics, as demonstrated by their ability to proliferate and differentiate towards a neural cell population in vitro. A cell line derived from the adult human retina (MIO-M1) has been thoroughly characterised and studied in our group (Limb et al., 2002). This Müller cell line expresses both the retinal stem cell marker nestin and the glial marker vimentin (Figure 2). Through culturing these cells with a combination of growth and differentiation factors (FGF-2, taurine, retinoic acid, IGF-1) in the presence of extracellular matrix proteins, they can be induced to differentiate into neuronal photoreceptor cells in vitro (Jayaram et al., 2014). Thus, upon culture with these factors, MIO-M1 cells acquire characteristic photoreceptor morphology and express gene and protein markers of rod photoreceptors. Although human Müller glial cells can be induced to differentiate into cells expressing neuronal markers in vitro, there is no evidence of neural differentiation in the human retina in vivo, where instead Müller cell gliosis leads to degeneration and glial scarring. The exact role and regulation of the gliosis-associated protein GFAP in human Müller glia is not fully understood, and the implications of this intermediate filament on the neurogenic ability of Müller glia has not been examined. Furthermore, it is known that during retinal disease there is upregulation of inflammatory factors such as TNF-α, amongst others, suggesting that factors produced during gliosis may prevent neural differentiation of Müller glial cells in vivo (Eastlake et al., 2016). My PhD investigated the role that the inflammatory cytokine TNF-α may play in regulating GFAP expression in Müller cells and the effect that this could have on the potential of Müller glia to differentiate into rod photoreceptors in vitro. Figure 3: Culturing MIO-M1 cells with increasing concentrations of TNF-α decreased GFAP protein in a dose-dependent manner. 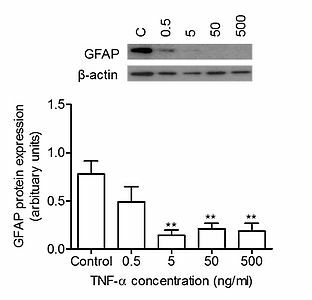 GFAP expression was significantly down-regulated by TNF-α concentrations >5ng/ml. One-way ANOVA, Tukey’s posttest p<0.05, N=3. C: control. Figure 4: Western blot analysis of MIO-M1 cells cultured with FGF-2, taurine, retinoic acid, IGF-1. 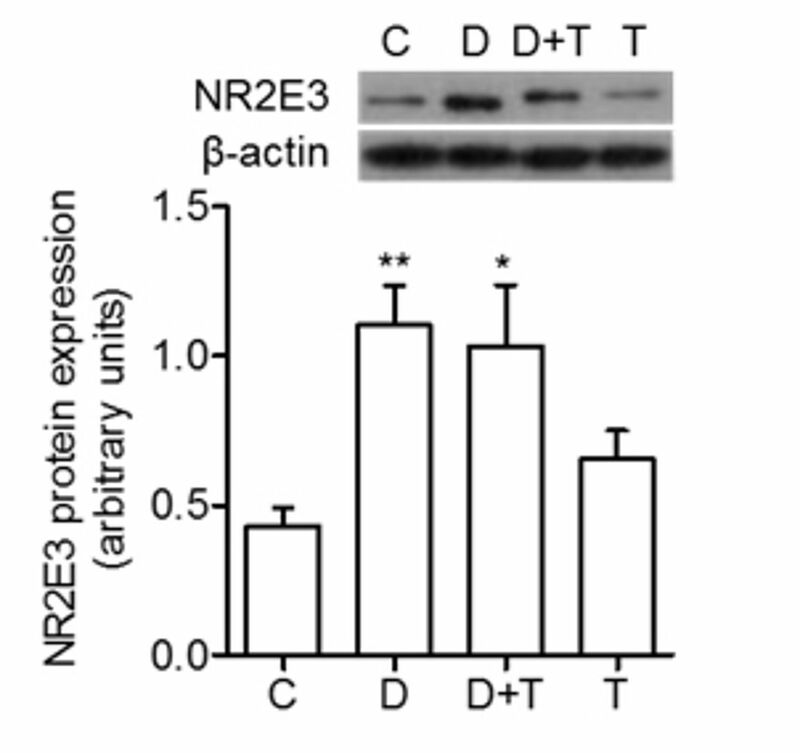 In the presence of differentiation factors protein expression of the photoreceptor marker NR2E3 significantly increases. 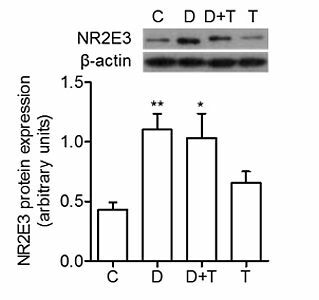 Addition of TNF-α did not modify protein expression of NR2E3 compared to differentiation factors alone. One-way ANOVA, Tukey’s posttest, p<0.05, N=3. C: control; D: Differentiation media; D+T: Differentiation media + TNF-α; T: TNF-α. 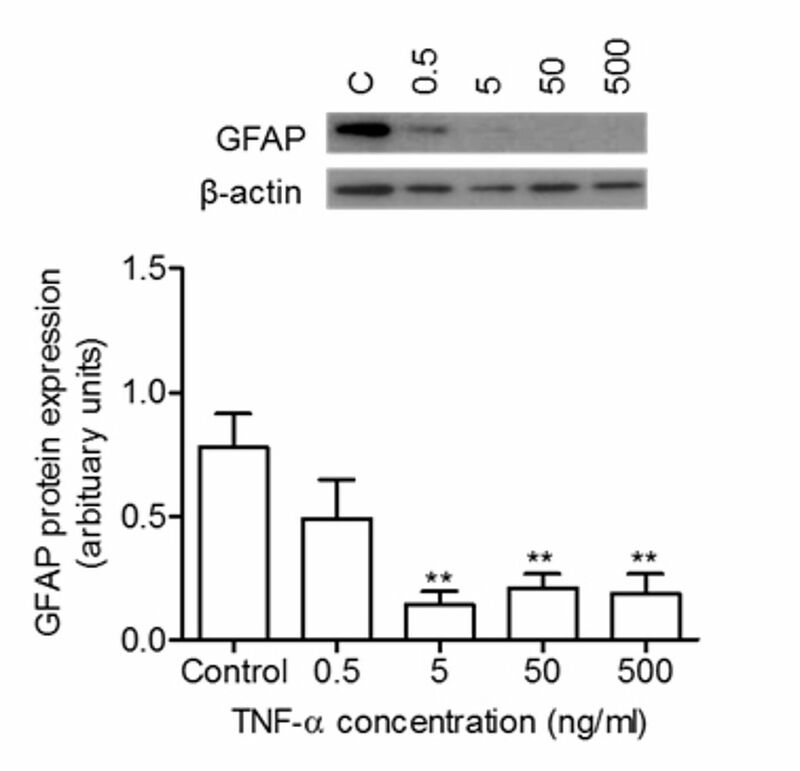 The results showed that TNF-α significantly down-regulated GFAP expression in Müller glia, suggesting that this cytokine may have a protective effect on gliosis (Figure 3). Additionally, the downstream transcription factor NFκB was shown to be activated in MIO-M1 cells cultured with TNF-α, suggesting that this signalling pathway may provide retinal neuroprotection and support cell survival. 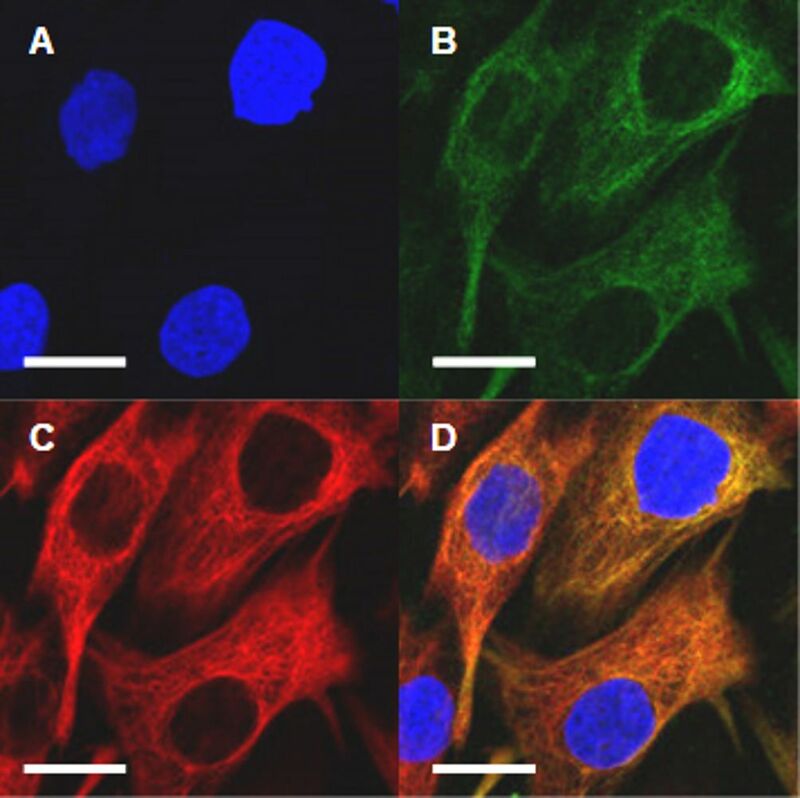 Culture of MIO-M1 cells with photoreceptor differentiation factors caused increase in the rod photoreceptor marker NR2E3 protein. However, expression levels of this marker were not affected by the presence of TNF-α, suggesting that this cytokine does not inhibit the neurogenic ability of human Müller glia in vitro (Figure 4). EASTLAKE, K., BANERJEE, P. J., ANGBOHANG, A., CHARTERIS, D. G., KHAW, P. T. & LIMB, G. A. 2016. Muller glia as an important source of cytokines and inflammatory factors present in the gliotic retina during proliferative vitreoretinopathy. Glia, 64, 495-506. FAUSETT, B. & GOLDMAN, D. 2006. A role for alpha1 tubulin-expressing Muller glia in regeneration of the injured zebrafish retina. 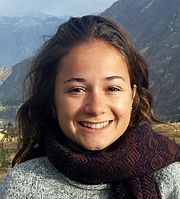 J Neurosci, 26, 6303 - 6313. GRAF, T., FLAMMER, J., PRUNTE, C. & HENDRICKSON, P. 1993. Gliosis-like retinal alterations in glaucoma patients. J Glaucoma, 2, 257-9. JAYARAM, H., JONES, M. F., EASTLAKE, K., COTTRILL, P. B., BECKER, S., WISEMAN, J., KHAW, P. T. & LIMB, G. A. 2014. Transplantation of Photoreceptors Derived From Human Müller Glia Restore Rod Function in the P23H Rat. Stem Cells Translational Medicine, 3, 323-333. LIMB, G. A., SALT, T. E., MUNRO, P. M., MOSS, S. E. & KHAW, P. T. 2002. In vitro characterization of a spontaneously immortalized human Muller cell line (MIO-M1). Invest Ophthalmol Vis Sci, 43, 864-9. REICHENBACH, A. & BRINGMANN, A. 2010. Müller Cells in the Healthy and Diseased Retina, New York, Dordrecht, Heidelberg, London, Springer. REICHENBACH, A. & BRINGMANN, A. 2013. New functions of Muller cells. Glia, 61, 651-78. RUNGGER-BRANDLE, E., DOSSO, A. A. & LEUENBERGER, P. M. 2000. Glial reactivity, an early feature of diabetic retinopathy. Invest Ophthalmol Vis Sci, 41, 1971-80. WU, K. H. C., MADIGAN, M. C., BILLSON, F. A. & PENFOLD, P. L. 2003. Differential expression of GFAP in early <em>v</em> late AMD: a quantitative analysis. British Journal of Ophthalmology, 87, 1159-1166.